Recently Tarkett launched their ‘Floor is the new Playground’ (http://bit.ly/1X6OzEs) online competition. 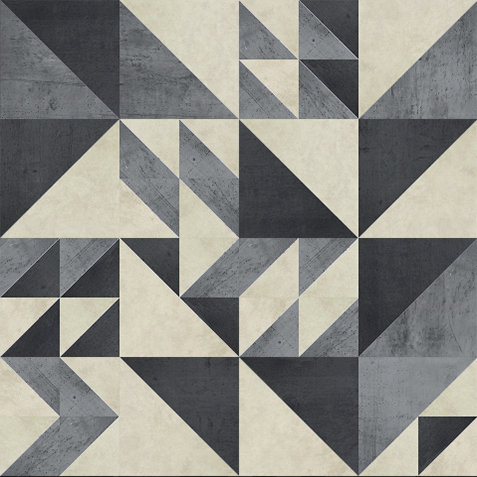 This was a call to architects and designers to show their creativity and design their own flooring pattern using a rather nifty browser app that allowed you to arrange floor tiles in a pattern and then submit the resulting design. Well what’s a designer to do in these circumstances but answer the call and take up the challenge! My initial patterns were a little tentative. Then the creative brain kicked in as I realised that the app allowed tons of freedom to play with pattern making. Quite apart from being able to change the colours of tiles, rotate and duplicate; you could also cut them up into new shapes and then later randomize the pattern with pre-set mirror and flip type actions. A world of endless possibilities opened up. Further patterns were submitted. Then the bug really kicked in…. having slavishly arranged the tiles by locking them next to eachother I noticed that you could overlap them to create even more configurations. This time even more pleasingly random. The premise of the competition or shall we say challenge was that designers would submit their designs in order to remain on top of the pile. As I played with the patterns and submitting; one other designer’s name kept popping up; René Wissinck from Atelier Argos based in the Netherlands. This was going international. Via Twitter we started to exchange ideas and encouragement and then – I would argue as all designers like to do – decided that here lay an opportunity to collaborate. Isn’t that a great vindication of what social media can do to bring people together. Oh a postscript – Tarkett announced a winning design for the competition and incredibly it was Cantoo. How fantastic is that! It has this mix of the classic and contemporary at the same time. The color mix is not too contrasted, but it is really well balanced. There is something interesting in the way we sort of recognize patterns within the patterns. Something of cement tiles, yet not completely. Finally, we recognize in this layout something of contemporary art. It could be a cubic or abstract painting…by Klee or Delaunay. The layout is an interrogation of what defines simplicity (we can talk about just triangles) and complexity (intricate arrangements). And in conclusion it looks like this is the kind of pattern you would never get tired of.